NEW YORK, September 24, 2010 - Terrorism affects Pakistan more than any other country and its people have rejected extremism, its Foreign Minister said Friday. "Pakistan is the greatest victim of terrorism in the world today, although I would never get this message in the US," Shah Mehmood Qureshi told an audience at the Asia Society. The minister, who was interviewed by Asia Society President Vishakha Desai, was in New York to attend the annual United Nations General Assembly meetings. “The bottom line is that we do not want the Talibanization of Pakistan, period,” he said, adding that it was in the interests of Pakistan prevent the Talibanization of Afghanistan as well. Last month's flooding, which impacted more than 20 million people in northern Pakistan, has prompted concerns that extremist groups might use the disaster to regain popular support. Qureshi firmly rejected this view, however, insisting that his government had been at the forefront of the relief effort. "The catastrophe is too huge to be managed by fringe elements," he said. "It is only the government that can take care of its people." He admitted, though, that there were "gaps" in the government's response. According to Asia Society Bernard Schwartz Fellow Hassan Abbas, these gaps could provide a recruitment opportunity for extremist groups within the next three to six months if the government does not step in first. Qureshi underscored the need for economic development to stave off the advancement of extremist groups, who recruit among the poor and unemployed. 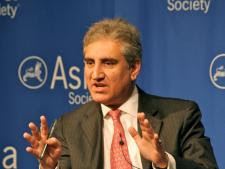 "We need trade, not aid,” said Qureshi, inviting more multinational investment in Pakistan. He also said that Pakistan and India need to resume direct trade with one another. "I feel we both stand to gain by engaging with each other," he said. Meanwhile, he described Pakistan and India's bitter dispute over Kashmir as "the festering sore of South Asia," saying an escalation in violence in the region proved India's military was using excessive force with more than 100 people killed since June. "This is a very serious indigenous uprising," he said. "We need a new strategy." Asked what role the United States should play in negotiations, the minister said that the US can act as a facilitator, but that the onus lies with Pakistan and India. "We do not need the US if we can do it bilaterally," he said.